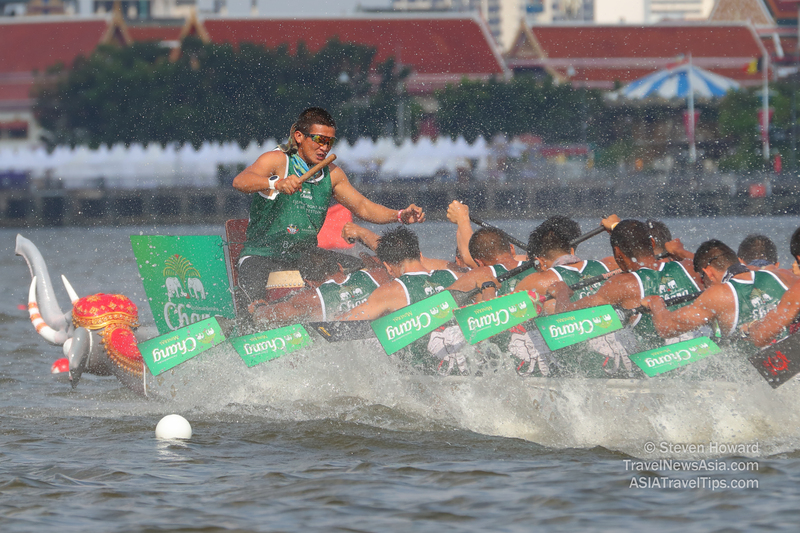 The elephant boat racing on the Chao Phraya River in Bangkok reached a frenzy on Sunday, with twelve teams from Thailand, China and Philippines all eager to stamp their name on the King's Cup Elephant Boat Race trophy as the first ever champions. The final four teams - Nonthaburi - Avani Hotels & Resorts; Institute of Physical Education - Mercedes Benz; Yutthakarnnawa (Royal Thai Navy Seals / หน่วยซีล) - Chang Mineral Water; Pradu Thong Goddess (Royal Thai Navy) - JW Blue Label went head to head in the thrilling final with only 4 seconds separating all the teams. It was the crowd favourites, the Yutthakarnnawa (Royal Thai Navy Seals / หน่วยซีล), that claimed victory. As the very hot day begin to cool, the crowds on Saturday grew in numbers to enjoy an evening of fantastic entertainment with a wide variety of food and drinks, and concerts from New Jiew and Singto Numchok. The event was not only about fun and games however, one hundred percent of ticket sales from the event will be donated to elephant related projects throughout Thailand via the Golden Triangle Asian Elephant Foundation. The Indoor Rowing Asia Cup Tournament was held alongside the King's Cup Elephant Boat Race with teams from 9 countries - Bahrain, Chinese Taipei, India, Iraq, Japan, Malaysia, Pakistan, Saudi Arabia and Thailand - competing. Each digital heat consisted of 8 rowers giving it their all across 2km with both female and male competitors vying for the coveted Asia Cup trophies. The winners of the woman’s Asia Cup was Yi-ting Huang from Chinese Taipei and Parminder Singh from India won the men’s championship. See also: Pictures from King's Cup Elephant Boat Race & River Festival in Bangkok, Thailand. See latest HD Video Interviews, Podcasts and other news regarding: MHG, Minor, Elephants, Boat Race.